Spinach is native to central and southwestern Asia, and is now grown in temperate regions throughout of the world. It is an annual plant in the family Amaranthaceae. Relatives include beets and Swiss chard. Spinach was cultivated in Persia about 2,000 years ago. Arabs traders, called it "the prince of vegetables". The Chinese referred to it as "the herb of Persia" as early as in 647 C.E. This leafy vegetable was grown in Spain as early as the 8th century and spread through Europe to Britain by 1300. A cookbook compiled for the use of King Richard II's household contains spinach recipes. European settlers carried the vegetable with them to the Americas. In the United States, it was commonplace in seed catalogs as early as 1806. Savoy has dark green, crinkly leaves. Flat-leaf or smooth-leaf has broad smooth leaves. It is easy to clean and often grown for canning. Semi-savoy is a hybrid variety. It has slightly crinkled leaves but is easy to clean. Spinach is definitely a cool-weather crop! It bolts - produces a flower stalk followed by seed - very quickly when the temperatures are high and day length is long. The terms "long standing" and "slow to bolt" found in seed catalogs identify varieties that have more tolerance for heat. Spinach is usually grown as a spring crop in regions with cold winters. It can be grown as a winter crop in warm regions. Spinach grows best at temperatures between 50 and 63 degrees F., and usually matures in 37 to 45 days. Seedlings are frost-hardy. It should be direct-sown as soon as the ground can be worked in the spring. Using a cloche or other protection allows earlier sowing. A fertile sandy loam that is high in organic matter is best. Soil pH should be between 6.4 and 6.8. Spinach is very sensitive to acidic soils. 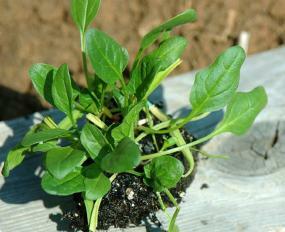 Spinach is usually direct-seeded. Plant the seed about half an inch deep. Space seeds 4 to 6 inches apart and rows 10 to 12 inches apart. Firm the soil gently over the seed. Use fresh seed. Seed over a year old has only an 80 per cent germination rate and older seeds are even less likely to grow. Fresh seed germinates quickly at around 50 degrees and adequately at around 60 degrees. Seedlings usually emerge in about two weeks. They grow slowly at first, then quite quickly. 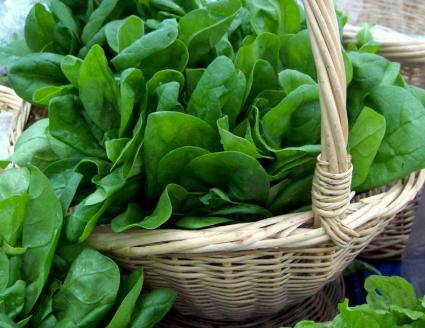 Like most vegetables, spinach needs a lot of water - at least an inch each week. If there isn't enough rain, water plants in the morning so the foliage will be dry before dark. Side-dress once during the growing season with a fertilizer that is high in nitrogen. Harvest as soon as the leaves are large enough to eat. Be sure to harvest before it starts to develop seed stalks.